What do the emission reductions of industrialised nations look like when you count the imports manufactured overseas? These researchers have found a problem with the way we count carbon emissions. When we count them, countries tend to count them for industries that emit within their own territorial borders, which means that emissions in the developing world have kept going up, while emissions in the developed world (or first world) have either flattened or dropped, depending on how much your government likes to admit the reality of climate change. However, most of the emissions from the developed world are to produce goods for places like North America and Europe. So these researchers wanted to work out exactly how much international trade contributed towards global emissions increasing by 39% from 1990 – 2008. Was the increase in emissions due to development in countries like China, or was it a case of wealthy countries just shuffling their manufacturing emissions to another country and continuing to increase consumption rates? As you might guess (spoiler alert) it’s the latter. Turns out all we’ve been doing is moving most of our industrial manufacturing emissions to developing countries and importing the products back, allowing everyone to say ‘yay, we reduced emissions!’ while the actual amount of carbon being burned continues to increase. But don’t take my word for it – what does the paper say? The researchers took the global economy and broke it down into 113 regions with 95 individual countries and 57 economic sectors. They then looked at all the national and international data they could get on supply chain emissions to produce goods between 1990-2008, as well as doing extra detailed analysis for the years 1997, 2001 and 2004. They called it a Time Series with Trade and it was based on GDP, bilateral trade and emissions statistics (all of which you can generally find at your national statistics office online). The only thing they left out of their analysis was emissions from land use change, because there wasn’t enough data for them to thoroughly analyse it. 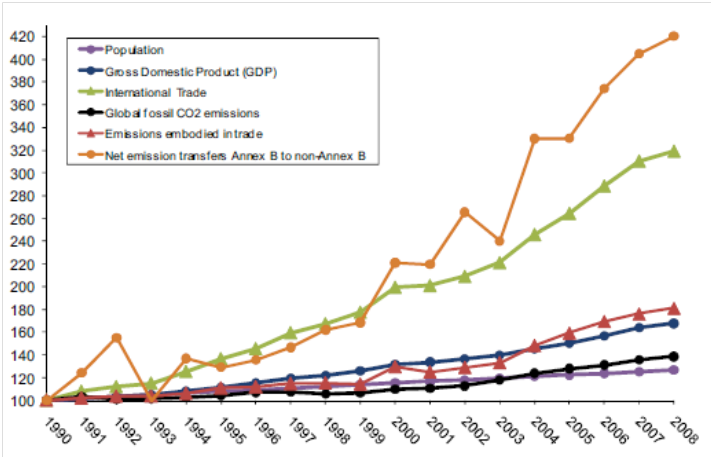 They found that global CO2 emissions from exported goods rose from 4.3 Gigatonnes (Gt) in 1990 to 7.8 Gt of CO2 in 2008, with a big increase in the decade up to 2008. Exports have increased their share of global emissions from 20% to 26% and grew on average by 4.3% per year, which was faster than the global population grew (1.4%), faster than total global CO2 emissions grew (2%) and faster than global GDP grew (3.6%). The only thing that export emissions didn’t grow faster than was the dollar value of all that trade, which increased by 12% each year. So not only are all those new iPhones costing you a lot of money (and making Apple super wealthy), they’re also burning a lot of carbon. But the thing the paper points out is that international trade has led to simply shifting the location of the emissions, rather than reducing the emissions – shuffling them around the planet to avoid counting them. 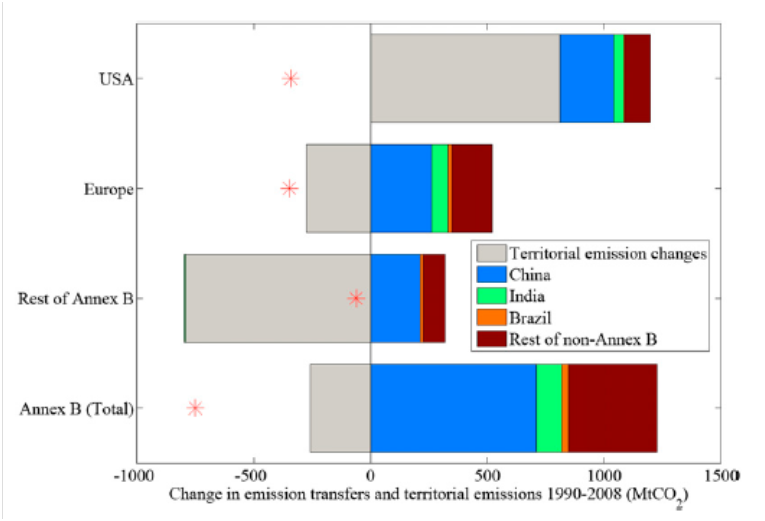 The researchers estimate that the transfer of emissions from wealthy countries to developing countries has been 17% per year increasing from 0.4 Gt of CO2 in 1990 to 1.6 Gt in 2008. This is an issue, because it means that all of the countries that signed on to Kyoto to reduce their carbon emissions – most of which promised around 0.7 Gt CO2 reduction per year – have simply shifted those emissions through trade to make them someone else’s problem, while continuing to consume stuff at an ever increasing rate. The researchers point out that while China is currently the world’s largest emitter of carbon emissions, with the USA at number two, if you counted consumption emissions (meaning you made the USA count the emissions for all the stuff they use that’s made in China), they’d swap places and the USA would be the world’s largest emitter. This makes sense if you think it through – have a look around your house at everything that’s made in China. All of that carbon that China is burning, which is destroying their air quality and polluting their cities and people; all of that is to make stuff for you to consume. If you count the consumption emissions, the emissions reduction of 3% from the developed world becomes an emissions growth of 11%. Oops. Also, the researchers point out that emissions reductions in wealthy countries are often exceeded by the growth of trade emissions. So what does this mean, other than the fact that everyone is trying to avoid having to clean up their own mess? It means there’s a problem with the way we count emissions from trade vs emissions from consumption. It also means that we’re currently failing to reduce our carbon emissions in any significant way, which puts us on a straight path to 4, 5 or 6oC of global warming, otherwise known as the next mass extinction. This entry was posted in atmosphere, climate change, greenhouse gases, mass extinction and tagged consumption, international trade, trade emissions by amyhuva. Bookmark the permalink.